Package Size: 34.8*28*6cm. Requires 4 AA batteries ( not included). Made of durable plastic. Considering the baby\'s skin is very delicate, the edge of the fishing set is designed with rounded corners. Safe to play. Includes 1 fishing pond with dolphin shape, 2 fishing rods, 2 fish barrels and 10 colorful fishes. Music can be controlled. Turn on the switch and music will be sounded. Kids can use the fish rods to catch the fishes and put into separate basket. Promote children competition and cooperation with others. 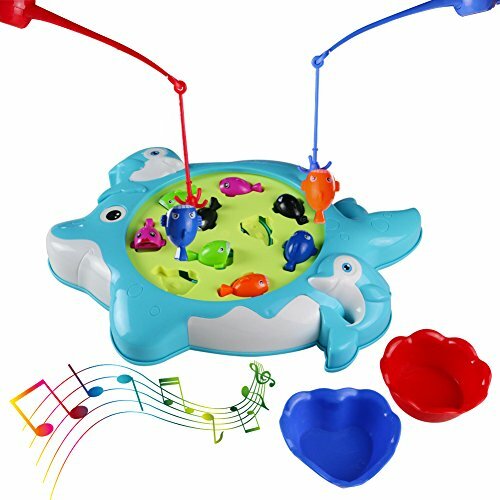 The fishes will rises and falls in the rotary fishing pond, it can exercise the child\'s logical thinking and flexibility.